Thailand isn’t zen country. 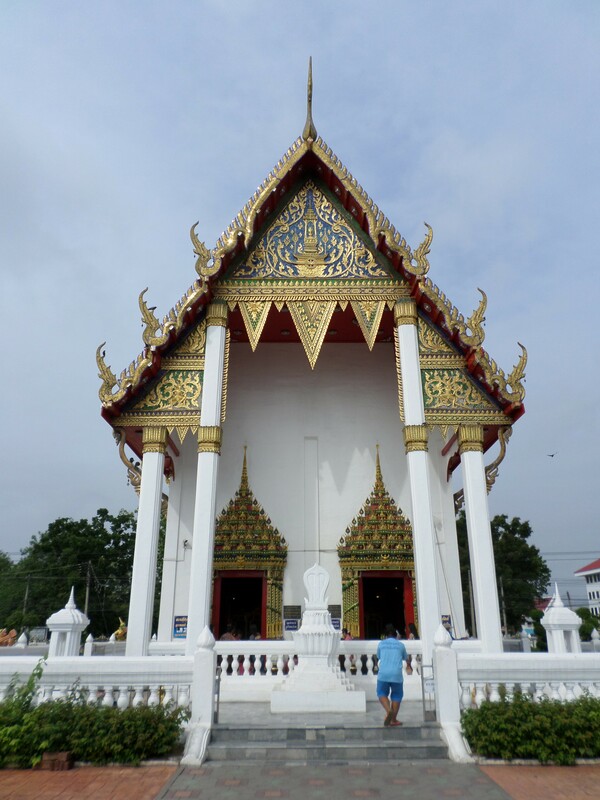 It’s deeply Theravadin, home to the “Doctrine of the Elders,” also known as Southern Buddhism, as it is characteristic of all of Southeast Asia. Other teachings took root farther to the north – Mahayana Buddhism in India and Tibet, and zen farther to the east in places like China, Japan, and Korea. True teaching, however, knows no geographical distinction, and takes place whenever one is slapped out of a dream and into reality. One morning during our recent pilgrimage, my wife, Jennie, and I stopped with several members of her family to make offerings at Wat Phra Sri Rattana Mahathat in Phitsanalok, the town about halfway between Bangkok and Chaing Mai where her mother was born. 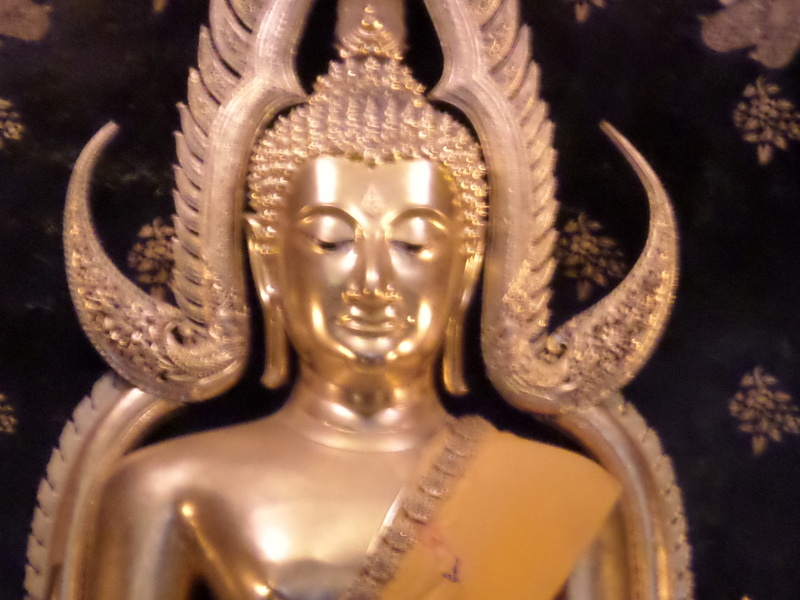 We were told that the Wat is home to the most beautiful golden Buddha statue in the all of Thailand. Candles, large bowls of sand for incense, and round trays for flowers were arranged along the portico outside of the temple. After making my offerings, I stood lazily in the morning heat waiting to get inside the temple when a streak of gray whizzed past the corner of my eye. I heard a sharp “Thunk!” and spun quickly to look behind me; I thought someone had thrown something. Turning back forward, I realized what the gray object was: a tiny pigeon chick. Glancing upward I could see its mother in a nest at the top of a column high above the marble floor. The chick couldn’t have been attempting a first flight; it was far too small and nowhere near fully fledged. It must have been accidentally nudged out of the nest. Whatever had happened, the fragile bald chick lay there motionless at my feet. It lay there dead at my feet. I was stunned into the reality of the present moment until a temple attendant came along and matter-of-factly swept the newly-born, newly-dead bird out of the portico with a straw broom. It appeared as though this was not the first time that this had happened. The attendant’s gesture seemed cold-hearted until it occurred to me that what had happened was a tragedy only in my own mind, conditioned as I am to the belief that life is vastly preferable to death. It also occurred to me that this unfounded belief is rooted in simple fear of the unknown. Reflecting on the incident, I considered that the bird’s life, while brief, may well have been fortunate. My mind was drawn back to the words of Rampuri Baba commenting on the dogs, cats, rats, and monkeys that invariably hang around the temples in India; there’s really no earthly reason for them to be there. If it’s food they’re looking for, there are far better places to hang out. Rampuri speculates that these animals are drawn by the energy of sacred places… perhaps they heard the Dharma in a previous life and are attracted to the sound of the chanting. 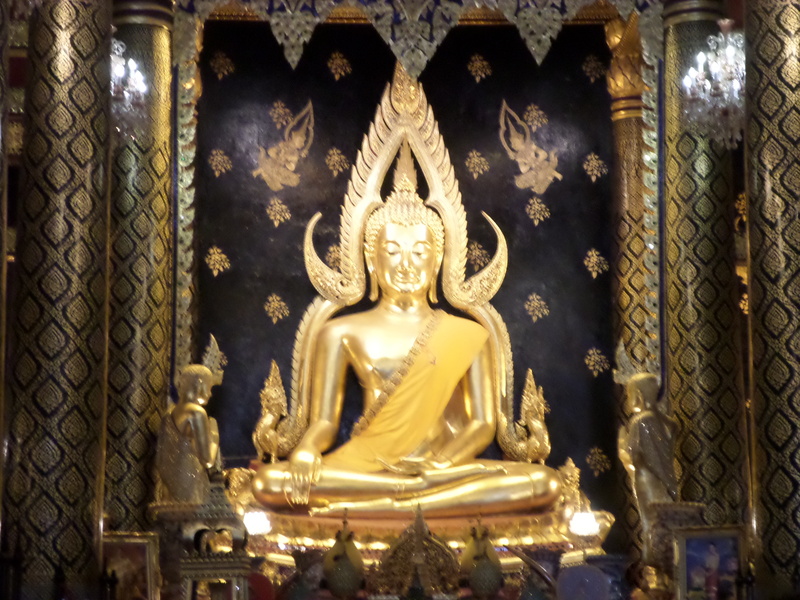 I’m no ornithologist, and, as such, can’t arrest to the level of sensory development of such a young bird, but even if she or he couldn’t hear the chanting, smell the incense, or see what is reputed to be the most beautiful golden Buddha in all of Thailand, the tiny pigeon felt the energy. Somehow, I feel as though I can attest to that. It seems likely that the vibration of love and devotion followed that being wherever it went after leaving its body on the marble floor of the temple in Phitsanolok. The bird died at the beginning of the day that would be the culmination of our pilgrimage to Thailand. We had come to return Jennie’s mother’s ashes to the place of her birth. Her name was Nola Saisakorn, and her family’s memorial stupa is at the foot of the hills outside of town, on the grounds of a temple built by her father. A couple of dozen more family members joined us to walk the newly cleared, freshly cemented path through the woods behind the temple. There in a clearing stood the family stupa, some fifty feet tall and recently refurbished for the occasion by a thoughtful and devoted cousin. The photographs and ashes of Jennie’s grandparents are sealed behind a glass door in the pale yellow façade of the stupa, and behind the glass doors on each of the other three sides are three shelves; Jennie’s grandparents had nine children, and there is a place for a porcelain urn containing the ashes of each of them. Five orange-robed monks led us in chanting as we circumambulated the stupa three times. 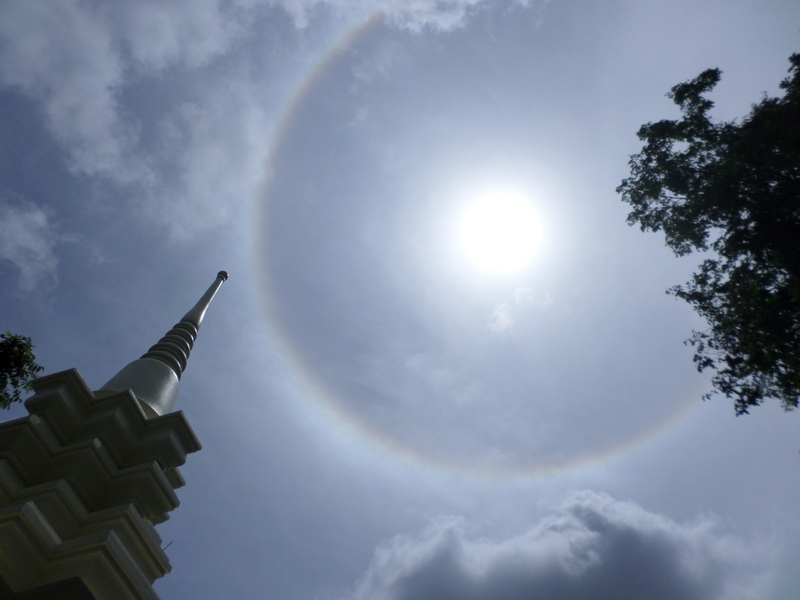 The clouds broke as Nola’s ashes were set in the stupa by her eldest and only son, revealing a rainbow halo around the sun. The monks all concurred that such a sunburst is an extremely rare meteorological occurrence in that area. Was this a sign of a soul’s ascension on wings of love and devotion? I’m not qualified to comment. I’m merely recording what I saw, and it was beautiful. I don’t know where people go when they die. I don’t know where birds go, either.